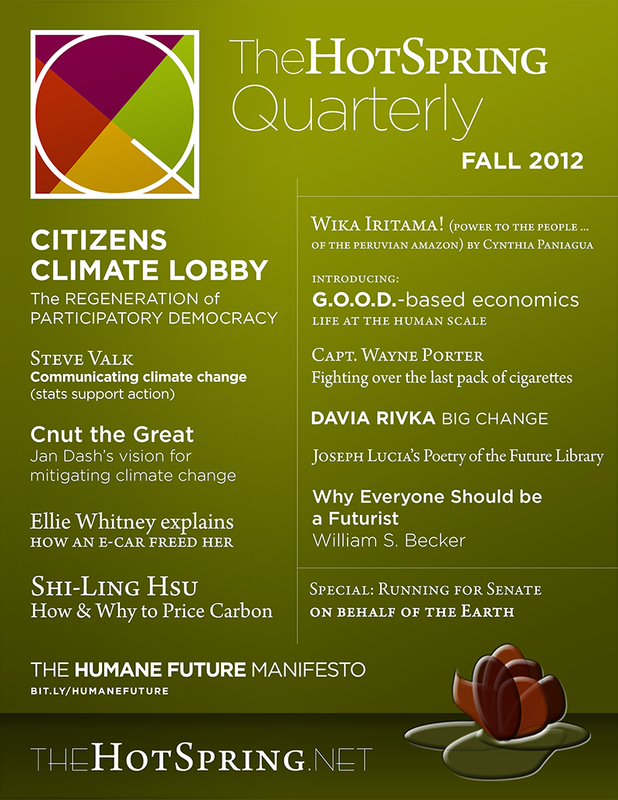 Welcome to the inaugural edition of The Hot Spring Quarterly. This publication represents the work of a community of thinkers, researchers, reporters, educators, innovators and committed change-makers, focused on cultivating a broader and deeper awareness of the types of crisis that face humanity. Our purpose is to share ideas to bring solutions into being that are better, more effective and more conducive to mutual thriving, than anything within the prevailing paradigm. We take as our thematic focus, for this inaugural edition, the Hot Spring Network’s slogan “hunting the paradigm shift”, because in all of the pieces we have collected in these pages, that spirit of thoughtful, humane, fairness-expanding change is at work. This project will also be the guiding philosophy of this publication, whatever thematic or disciplinary focus there may be in future editions. Visit TheHotSpring.net for more information regarding generative economics, clean energy and fuel free transport, people-focused innovations in public policy, including education, energy, media and finance, and for a leading-edge exploration of the accelerating technological phenomenon of hyper-convergence, in which media devices are integrating more and more seamlessly into our psychological, political and material lives. We are working to build a global community of interested, imaginative collaborators, hopeful about the future and committed to contributing their voice, their energy, their creativity and their leadership, to building better outcomes into the fabric of choices and influences that define our experience and determine conditions at the human scale. We hope to bring you the information you need to be part of that process. Visit the HotSpring Quarterly main page and learn how you can contribute concepts, articles, author suggestions, and more.